I have made lots of quilts with this pattern but I just can’t help it….it goes together so quickly (this took me an hour and a half) and always looks like a lot more work than it actually was. Most these fabrics are Nicey Jane, but there are some others I threw in there too. I think it measures around 34” x 40”. The pattern for this one is the Disappearing 9 Patch tutorial (on my sidebar or top toolbar). It’s one of my very favorite patterns and I recommend it to anyone as a first quilt! The fabrics are mostly from the Nicey Jane collection by Heather Bailey. Hope you all had a wonderful Mother’s Day!!! Lovely, as always! I have a few potential disappearing-nine-patch quilts swirling around in my head. I agree, they look great, and come together so easily! I just love your blog, projects and tutorials! they're really inspiring. Thanks a million for sharing! darling quilt! love nicey jane too. Your quilt turned out lovely. I love this pattern too, and seem to come back to it often. That is exactly why I didn't get any Nicey Jane at my FQS last week. I'd rather feed a family, thanks! I like the non-floral Nicey Jane combo you have going. Lovely. I am a tightwad, (I mean thrifty!). I don't use anything but sheets from Goodwill for the backs of my quilts. $2.38. I like those prices! Love your blog (can't wait to try out this pattern – looks great and so easy!). I've become a huge fan of online fabric shopping as well. I try to support my lqs when there's a good sale but other than that, I wouldn't be able to afford to quilt. Tax is the key word, I hear ya!!! Just consider yourself lucky that you don't live in Canada or Australia where we pay $15.95 to $25.00 per metre of designer quilting fabric! Granted we get an extra 4" over a US yard cut, but still!! Beautiful! I want it! I wish I had an extra $90.. would be perfect for my little one who will be here shortly. I love that quilt it looks fabulous! I feel your pain on fabic prices. In Canada I pay an average of $16-18 a metre plus tax. The only saving grace is that tax in my province is the lowest in the country at only 5%. I would love to buy online more often but with shipping and exchange and then fees at the border (ugh!) I usually only save about $3/m. So now I try and wait for a trip to the states to so any major buys. Luckily I'm going to Portland in the summer!! Such a cute quilt!!! I'll have to dry the 9 square some time. Hi Mama Allison! How is that sweet baby? You are a busy mama! I am posting you up today on my blog! Sharing your Scrappy Rose Broach with my readers! Linking back to you my dear! I will also link it up on Midchix.com in the Crafty Mamas Flock! Have a blessed day! I love the Nicey Jane with the darker prints mixed in…very nice combo. I keep wanting to try a disappearng 9patch. Thanks for sharing yours. Fab quilt! I love all HB's fabric ranges, but wasn't a fan of that big spot – BUT, I love it as a quilt back, yum! In Australia, quilting fabric sells for between $22-$26 a metre – that's why we buy online from the USA! Disappearing 9-patch is such a great pattern. I even used to work in the LQS and now buy most of my fabric online. I would love to support my LQS but with all our family paycuts in the last year, I mostly buy online. I'm always amazed by the prices of fabric. Thankfully the most expensive fabric I have found around here is about $7.20 and I can get 10% off with my quilt guild membership. Most fabric is in the 6.00 per yard range, but I try to hit up sales. No way could I afford to quilt if fabric was 10 or 12.00 a yard. I'm totally with you… I couldn't have bought that fabric at that hefty price either. I work at my LQS so without the staff discount I'd definitely not shop there as much. And tax always annoys me. We only have 2 fabric shops (privately owned) in the area, and I have a hard time paying those high prices! I can shop at etsy plus pay shipping and still save money. Not to mention our sales tax is 9.75. I'm currently working on a Nicey Jane disappearing 9 patch… so I'm happy to see how lovely yours turned out. Love the polka dots on the back. Very cute! I have noticed that all the fabrics at My Needle and Thread are much better priced than anywhere around me. Plus she takes such care in the preparation of the fabrics for shipping – I don't buy fabric anywhere else! And I also like that she coordinates her lines…guess I'm definitely a FAN of My Needle and Thread on etsy!! Sheesh, don't come to Canada. Our fabric here is $15-19/metre. Granted, we are getting a tiny bit more (a meter is slightly more than a yard) but still. It is so tempting to buy loads on-line. And when I need yardage I tend to. But generally I reserve my on-line shopping for things I can't find in a LQS. Completely in love!!! I seriously adore it. I'm in Canada and fabric prices here are almost always twice what they are in the US, even though the dollar is almost at par. I would love to support my LQS but I simply cannot pay $16/yard for fabric. $10.89/yard would be a giant sale here! There are a few online Canadian stores that seem to have clued in and have a much smaller markup but the rest act as if the internet does not exist. I order 95% of my fabric from American online shops, mostly on Etsy. I hear you sister….so I try to shop as much in my stash as possible. Our local shop had a sign with "Amy Butler on sale 25% off". I told my quilting students all about it after calling the shop and being told the sale was on til Saturday. Well, my students got there and NO sale. When I questioned the owner she told me that "She changed her mind, which was HER right since it was HER shop". Guess what….I don't shop there anymore!!! I like the Disappearing 9 patch for the same reason — it looks so complex, even though it's so easy to make. And, fabric buying travails aside, those polka dots are the perfect backing fabric. An hour and a half!! My, thats amazing work in such little time. Fabulous. I say it everytime I see an amazing quilt… I wish I could make one. And may I just say TWO cookies! My favorite LQS has a "buyer's club" which you have to pay to join, so you can buy fabric at a "discount", because every price in the store is inflated to encourage club membership. I'm sad to say I go there to get my ideas but then come home to order online. There are few fabrics that I cough up the big bucks for…..Nicey Jane is one such line. The quilt is lovely. Adorable! I've never quilted before, but you have me inspired! I would love to make one for my baby girl. I wonder if every city has a cranky old lady fabric store? We certainly have one where I live. LOL! Oh yah, I have found 95% of the quilt stores i've ever been to to be cranky old lady stores. I used to think it was because I was young, but i'm not young anymore and they are still just as cranky and cliqueish! I'm used to paying $9.50 or $10 a yard for designer fabric. My favorite quilt store has all the best designer stuff, but I have one beef with them: They charge $3 for a fat quarter when the yardage costs $9.50. Every quilt shop i've ever seen, online or bricks, charges a quarter of the price for a fat quarter, so $2.25, $2.50, $2.75. I asked why and she said it was for the convenience of a pre-cut quarter. I said ok, i'll take a straight quarter cut then, and she said that was the same price. ??? Whatever. I have the same problem with most of my LQSs. I can't afford it. Unfortunately, that's why I shop online so much now. LOL! I need a cookie too. 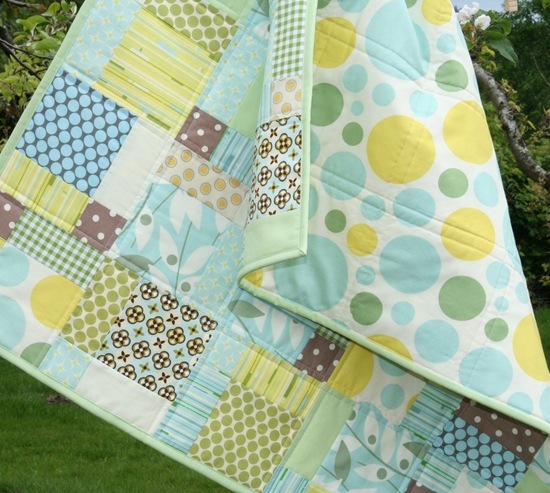 Lovely quilt…love the large polka-dots! My lqs sells fabric between 9.00-10.50…needless to say, I don't get to buy much very often. Jelly rolls here in Australia have been up to $70 each!!! Honey buns are usually around $35-40 and yardage is up to $25 a metre for Moda! We can get it so much cheaper buying from the U.S. and thats including international postage!!! Our only local quilt shop just closed. I wish I could say I was sorry, but I couldn't afford to shop there anyway. At least your quilt shop has heard of designer fabrics. My local one is filled with icky tone on tone florals and novelty farm tractors. I buy 95% of my fabric online because even with shipping to Canada, it's 30%-40% cheaper than buying locally. I always consider moving to the States when I make a fabric order, because of your cheap and fast shipping. Oh well, by the looks of my stash, I haven't been suffering any! I love this quilt, gorgeous fabric and I really want to try this design too. Please tell me it wasn't Polka Dot Pincushion? they are notorious for being over priced and rude. My daughter called me in shock on Friday, saying that the fabics at her lqs were over 10.00! Whew. I'm so glad you found that dot for the back and that you ordered it instead. Also, I've found that often quilt shops owners are grumpy. I'm scared of all 3 of the 3 that I frequent! Beautiful shop, that line is one of my current favorites! I was so excited to see that you also shop at My Needle and Thread — what a wonderful shop and their selection and customer service is awesome. Just consider yourself lucky you're not buying fabric in Australia. Lovely quilt! You have a great sense of colour. I am another whiny Canadian. My LQS only has ugly tone on tones, etc, no designer stuff. Two hours away is the only quilt shop I have found on the prairies (there might be some in Alberta) that even carries Free Spirit and Rowan stuff, and they charge $18/metre (plus the gas it costs me to get there). So I do buy online, and try to max out the flat rate envalopes for maximum shipping. It really is riduculous, considering that the dollar is at par, that Canadian prices are still so high. I am with you!!! I went in to a couple of QUILT shops this weekend to get my mom a gift card and I was appalled that the fabric was $10 a yard or more. WHAT? that is outrageous. So I turned around and went to a regular old fabric store. The prices were a lot better there. I think when it is called a quilt shop they can charge more. I love the quilts you make they are always adorable! Love it! This is my new favorite quilt pattern, too. And, I enjoy seeing how the Nicey Jane works in real life. We are about to get our first quilt shop in our town. I'll be glad to see the items in person and play with different combos, but I really like my favorite fabric shops on Etsy. (They're fabricpalooza and Sew Love Fabrics.) The prices are way cheaper. I don't feel bad about going to most of the Etsy sellers since their online business is either something they do from home to support their families or is an extension of their shop. If the local ones are even close to the online prices, I'll gladly buy there as well. But, $10 a yard? No way! oh i love it!! very nice! Love the venting. This is why I'm happy to be living in Korea right now where all the US quilting fabric is $3 a yard! Woo Hoo! Too bad I'll only be here for another 2.5 years. Fellow Canadians, there are a few Canadian sites that offer better than LQS prices (here in Sask, I pay $18 a metre). Not affiliated, but I love Pink Panda (great fabrics, customer service and free shipping) and Sew Sisters (check out the Clearance section). I love Nicey Jane. In my LQS in Ontario it was 16.99 a metre… YIKES…I wonder also how they are competing with online pricing. I just LOVE this quilt! The fabric is fantastic and I cant believe that it only took you an hour and a half to piece it! You are amazing! love the quilt! the colors, and placement are wonderful! thanks for sharing! love your blog! I'm with you! Online all the way! My lqs sells Bailey and Butler for $10.50/yd, while most other fabric is $10. Designer premium, I guess. This shop is so pushy. I took a class there and got in trouble b/c I didn't buy my supplies from them. The teacher (and manager) actually spoke to me about how they really prefer you get class supplies from them. The nerve! And it's so refreshing that not only do online shops save you money, but they often throw in freebies. I had a similar vent just this week. Only it was my poor husband who had to listen it. He didn't commiserate with me as much as you would have! Mine is at $10+ too. It kind of levels the playing field when it is the *same* fabric everyone is selling. I would rather shop local too but I don't want to pay for the privilege. On another note… I love your quilt. The addition of the gray polka dot is awesome!!! : ) I love your color sense. Fab quilt! I just ordered some Nicey Jane in this color way … online … so now I know what to do with it. I agree that it is sad to see prices getting so high in stores. It stinks because, like you, I'd like to support them. But technology has really opened the marketplace and our traditional stores are going to have to find new ways to compete. I think we all need to visit Erika in Korea and take at least one huge empty bag!!! i don't have many local options for fabric, so i tend to get a lot of fabric from hawthorne threads online (hawthornethreads.com)and i've been really pleased with them. Love your new quilt and it is the fabric that makes it look so interesting and lovely. I agree with you the fabrics are getting way too expensive. I buy mine always on sale most of the time and I have seen fabrics for 13dollars a yard. I often wonder why the prices have gone up so much. For you it is even worse you whip one quilt up after a other. I will have to try that pattern next time. Happy quilting can't wait to see what you make next. I love this quilt. Beautiful Colors and design. I am beginner quilter. I have several blocks finished and waiting to be put together! I am making my very first quilt ever. I've been inspired by your blog. Thanks for this great idea. I'm making a queen sized quilt for my son and am using 10 inch squared blocks to try to reduce the potential frustration level. This will take it to a better looking quilt. Thank you again! Now you know how lucky you are to find quilting fabric at such good prices in the US. Here in Europe we pay 16 euro/yard (which is about 20 $/yard)…That is why I buy online in the US (paying 13 $ shipping every time)!! I love love love the quilt. Yes, the fabric shop nearby closed down recently. They had a pretty good selection and whatever, but they were outrageously priced. I love to look online! I wouldn't be able to afford to quilt. 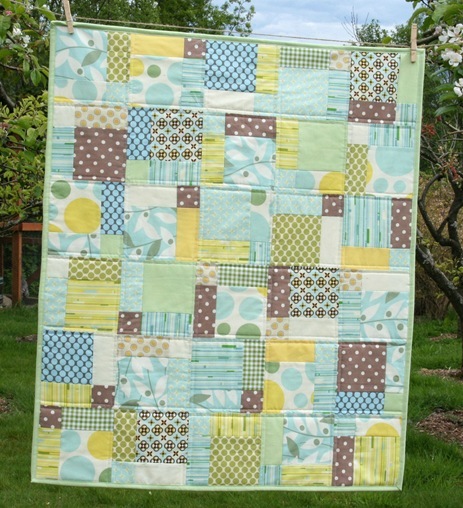 I wasn't a huge fan of Nicey Jane, but then I see this quilt and think, My oh my! I must get me some of that fabric! Great quilt! I'm so glad someone finally said it out loud. I try to patronize our local shops. One is mostly $9.50-$10.50 a yard, another the same, and another you can get great Westminster prints from $5.99 and other stuff $7.99 and a little higher. I now buy from the 3rd only to be supportive and do the rest online. For $35. I can get 7 yards instead of 3 with free shipping. Lots of online stores, including Etsy have great sales on new arrivals too. It's sad if stores go out of business, but they need to accommodate people's financial needs too. Now, I need a PayDay bar! we must shop at the same quilt shop! haha, mine has some pretty cranky ladies too! what's up with that anyway? I have found all of these comments to be very interesting. I'm 50 years old (does that make me an old lady?) and I work inside the quilting industry. Because I receive so many supplies through my job and purchase fabric at full retail only occasionally, I really was not aware that LQS were charging more than online shops in general. I can see how frustrating this must be and how it would drive people to shop online. It would be interesting to hear what the other side of this story is–to know the thoughts of a LQS owner. I know that small businesses struggle mightily to keep things afloat, and LQS are no exception. For me and for the industry, it is so exciting to see young people interested in quilting/sewing. Believe me when I say that we welcome you, need you and want you! Even though I have been sewing for 40 years and quilting for 25, I visit blogs of young sewers daily for my inspiration. The enthusiasm is a breath of fresh air! My own daughter, age 25, has just been bitten by the fabric bug, and I couldn't be happier. I know she will have a huge community of women her age with whom to share this passion. Love this quilt. Haven't heard of this quilt pattern yet as I am fairly new to quilting(even thought I started quilting 6 yrs. ago) I love your work, and the polka dot fabric – beautiful choice. I love your quilt. I want to make it, I've never made one but I'm ganna try. What size block did you start out with? Hi I love your quilts and love read your blog. I was interested in this post to read about how much you pay a yard. I live in New Zealand and pay in the shops anything between $28 to $35 a meter for a brand such as moda( a yard is 91 cm so just short of a meter for those that are not sure). Taking the exchange rate in consideration US$9.50 should equate to NZ$13.20. Even allowing for import costs I am disgusted to discover that I am paying up to 3x the cost of the same fabric in th USA. i completely 100% copied this quilt! well, except for the fabric. i loved the way you laid out your blocks, and the way you quilted it, so i did mine just like yours. so, thanks for the inspiration. i'm so happy with the quilt i made, but it's a gift for a friend, unfortunately. i'd love to keep it. I just stumbled on this when I did a search for dissapearing 9 patch. This is so lovely! Great job! I too am feeling the same way about the local quilt shops. It's such a shame. I hope they don't have to close because it is so nice to see and combine fabrics in person. But it's also so hard to pay such prices. A year later . . . I found this and I think it is beautiful! It inspired me to make a similar quilt! And another 6 months later comes another question! What size fabric squares did you start with? I love this quilt! The colours are beautiful. Can you tell me if the full moon (amy butler print) is in sky or slate colour? And I'm also wondering if you know whether you can tell me what the large geometric print is in the block second from the left in the last row? It's gorgeous!!! I dont know much about quilting but love this site. Love D9P's and just sent my most recent one to my sister in Florida–she loves it. And I love that it looks Way More complex than it truly is. Yours is gorgeous; the colors sing to me. Love this quilt and thinking of making it for my next grandson.. although I've looked at your patterns and am not seeing it listed there.. I saw the tutorial and it's helpful but doesn't tell me how much total material of each print I might need… or did I miss that somewhere? I'm not working with scraps so I will be purchasing new fabric . Can you help? Thanks Allison… I appreciate your help!